We ask for a £100 non refundable deposit, on paying this we understand you have read and fully understand our Terms and conditions. A £100 secuity bond is also required when paying final balance, this is fully refundable after your stay should the caravan receive no damage, spillages or stains. If any damage cost will be deducted from the bond and remainder refunded. Balance should be paid 6 weeks prior to your stay. For full booking terms please read our T&Cs Our lets are Monday-Friday, Friday-Monday. Friday to Friday Or Monday to Monday. LEAD GUEST MUST BE 25yrs OR OVER. PLEASE NOTE THIS HOLIDAY HOME SLEEPS 4-5 MAXIMUM. PLATINUM GRADED LODGE STYLE 3 BEDROOM STATIC CARAVAN WITH PATIO DOORS LEADING ONTO GATED DECKING AREA. WITH PRIVATE PARKING SPACE. STUNNING SEA VEW PITCH. East Lothian has over 40 miles of coastline with stunning sandy beaches, open countryside, and award winning attractions, and restaurants , not only that it has some of the worlds best links golf courses. If you enjoy cycling, walking, golfing, water sports, bird watching, there is an abundance of choice within the area for you to enjoy your stay, and all just a stones throw from the Scottish Capital City of Edinburgh. Our 2017 Pemberton holiday home is a haven of tranquillity for those looking to relax with all the comforts of home. The colour scheme gives the feeling of being totally relaxed the minute you walk through the door, with cool blue tone curtains that enhance the stunning sea views from the French doors, which lead onto the gated decking. private parking space, and only a 5 min walk from the main complex. The holiday home is built to residential standards, and therefore has a higher grade of insulation, keeping you warmer in winter and cooler during summer months. We have just installed a wireless room thermostat, this will allow guests to leave heating on in cooler months, and keep holiday home at the optimum level of comfort. The holiday home has 3 bedrooms and sleeps a family of 4-5 people comfortably. The master bedroom has a double bed, with a 5cm cool flex memory foam topper for added comfort, bedside cabinets, reading lights, wardrobe, and en suite toilet with wash hand basin and storage. Hair dryer and straighteners are provided. Dyson hoover. All bedding, bath and hand towels are provided for your stay. The 2 single bedrooms (1 twin) have overhead storage and shelving, wardrobe space all bedrooms have black out lined curtains. The Hallway is carpeted and has a thermostatically controlled radiator keeping this area cozy, coat hooks above in recess, glass and wooden door separating from kitchen. The kitchen, comes fully equipped with everything you should need for an enjoyable stay, full sized cooker with electronic ignition, integrated frost free fridge freezer, multi function microwave, integrated Beko washer dryer and integrated slimline dishwasher, coffee machine with a selection of pods we provide complimentary tea, coffee and sugar. Fairy liquid, a selection of cleaning products, and tea towels are included for your stay. The dining area has a large window flooding the area with natural light, dining table with 6 chairs, tablemats and coasters, salt & pepper. A wipe clean tablecloth is provided. This is a very versatile holiday home, the dining area and living room can be open plan or closed off with the bi folding doors, thus creating a more intimate atmosphere, a great addition to when the children are in bed. The living room has a freestanding sofa; cuddle chair and an accent chair with matching ottoman with storage, 2 side tables, and classic fireplace with flame effect electric fire. The television unit has plenty storage. A dvd/blue ray player, with a selection of family films for those rainy days. We provide a selection of board and card games for those special family moments. 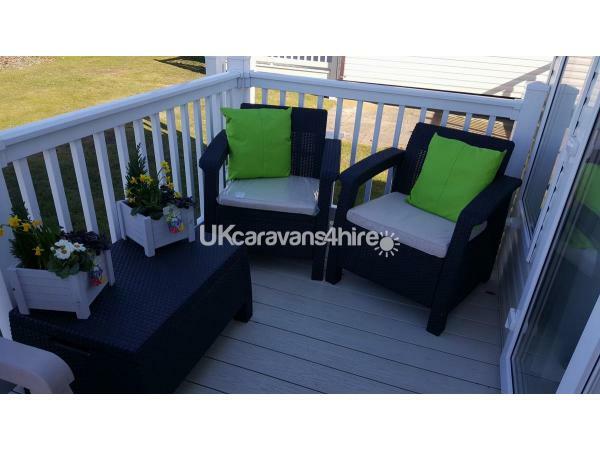 We have rattan effect sofa and 2 chairs, coffee table for the decking, cushions are supplied for guests comfort. The decking for part of the day is shaded, which is a nice break from the sun. The patio to the side is an absolute sun trap, We have a picnic bench with parasol, and a bench to the side again offering extra seating. cushions are also provided within the storage seat, for guests to use, all we ask is that they are returned after use. We have some fold away chairs that guests may use for the beach, please just dust off, before re storing away. The caravan benefits from a family shower room with double enclosure shower cubicle,which is thermostatically controlled, toilet and sink, radiator, and extractor fan. We where possible will meet all guests on arrival, and make sure everything to your satisfaction. Seton Sands Holiday Village, offers many facilities on site, including: soft play area, Archery, Play parks, and enclosed sports pitch, Ranger activities Golf course,) Arcades, Pool tables, Darts, . trim trail, the swimming pool has undergone an extension, and refurbishment. Mini market for those little purchases, and last minute presents for family and friends, and a launderette. The live lounge in the complex is where all the party dances, bingo takes place and star acts perform. There's also many different children's clubs for your children to enjoy, please see whats on guide for activities and times. East Lothian is an area of outstanding beauty with its many beaches,either opposite the site, or just a short car ride away, Gullane, Yellow Craig’s, the inspiration for Treasure Island, North Berwick, with the award winning Sea Bird Centre. Boat trips round the Bass rock. East Lothian has many fabulous golf courses within the area, so why not bring your clubs along too and enjoy the stunning scenery that the area has to offer. For those who love history there are many castles worth visiting in the area, Dirleton, Tantallon, Edinburgh Castle, why not buy an explorer pass, and visit during your stay. The 26 bus service stops right outside the park, why not leave your car and take a trip by bus to Edinburgh zoo, Princess Street for shopping. For the avid bird watcher, Levenhall links is a 10 min drive from park towards Musselburgh, with hides which overlook the marsh. East links family park a favourite of ours and if you really adventurous why not visit Fox Lakes Adventures, a rope course over water, sedge-ways, and a new zip wire experience. We provide a guest information pack in the caravan which will include places to visit etc. There may be some discounted vouchers too, so please take a look. WE DO NOT SUPPLY PASSES WITHIN THE COST OF YOUR STAY, THESE CAN BE PURCHASED ON ARRIVAL FROM RECEPTION. Daisy bikes, junior segway's, and many activities such as bungee trampoline, Archery, football academy to name a few. Some activities will require booking and may incur an extra charge. Beach wheelchairs are available from site. Bus at site entrance to Edinburgh every 15 minutes. Thank you you are always welcome. So glad you enjoyed the new van and Park. We feel exactly the same way. Had a wonderful stay at Seton Sands, the location of the caravan was ideal with a great view of the beach. The caravan was immaculate, with fresh towels, toiletries and lots of other little extras. It was lovely of Louise to meet us on arrival and show us around the caravan with a welcoming bottle of prosecco and chocolates. Louise went over and above what we expected and we would definitely come back. Thank you for your lovely review, you and your family are welcome back anytime. A beautiful caravan absolutely top of the range,so well presented it could be used as a show caravan on the site.especially with all the extras, towels and linen etc.It was a pleasure to stay there. Louise was so welcoming and friendly she felt like a friend. I would not hesitate to recommend this caravan to any of my friends and relatives.It was indeed a pleasure to stay there. 5 ?? Thank you for your wonderful review, it was indeed like welcoming friends to stay, lovely couple, the chocolates were a lovely gift so thank you so much, we would welcome you back any time. take care. This is a return visit to Louise’s caravan. We stayed in her caravan at Haggerston and have happily moved to Seton Sands as we were, and still are, so impressed with how clean and well equipped it is. A true home from home with everything you could need. Louise is so thoughtful and exceptionally helpful before your stay and only a phone call away if you have a problem. We will definitely be back. Thank you very much. Thank you Lois you and your family are always welcome, we are so glad you have enjoyed your stay at Seton Sands. It was a pleasure meeting you and your family. Thank you for your fabulous review, you and your family are welcome back any time. Thank you Sarah for your lovely review, you are welcome back anytime. we very glad you enjoyed your stay and thank you for the wonderful feedback, we look forward to welcoming you back for fire works weekend. Thanks so much for your feedback, and so glad you had a great time this year also, you are welcome back anytime.